I painted my first big RV garage door to look like wood this week. There were several challenges with painting this big door that I do not usually encounter with a standard size door but I was able to create a really nice wood look on the big garage door. 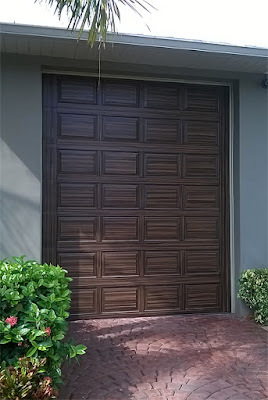 I sell an ebook tutorial that explains the step by step process I use to create this look on a garage door. 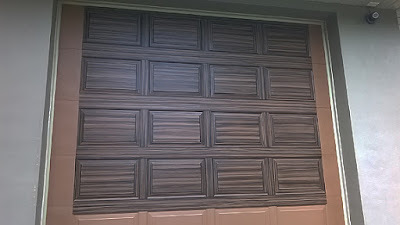 The Garage Door Tutorial here. 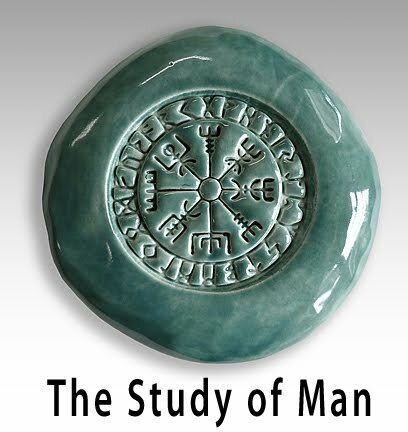 The first photo is the completed project. 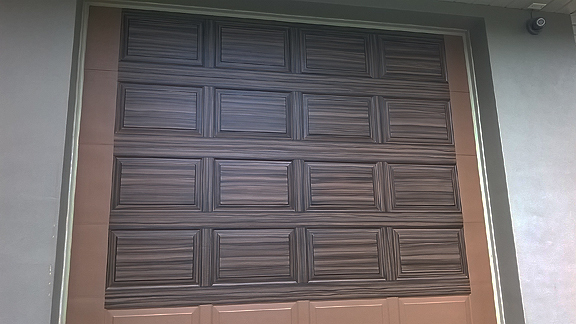 You can see how tall the door is. A standard garage door is 4 rows high but this one is 7 rows high. 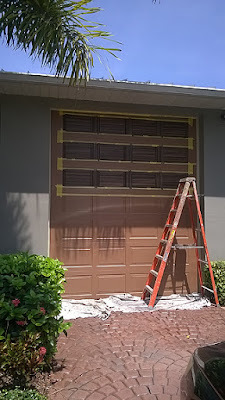 I always start a garage door painting project by cleaning the door really well with a scrub pad and soap and water. 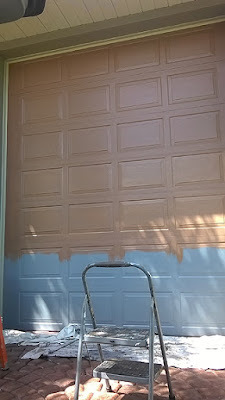 Then I apply a primer coat and then the base coat of paint. In the next photo it shows where I have primed the door and I am almost finished applying the base coat of paint. 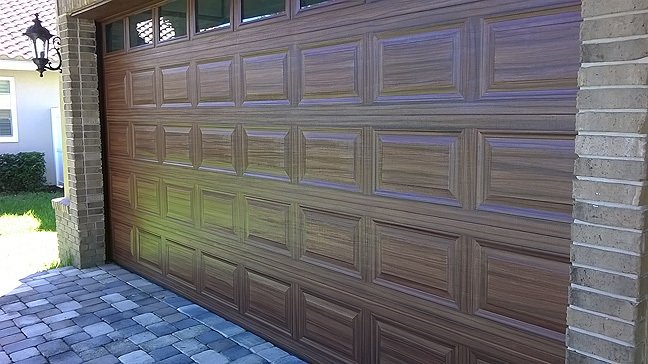 In this case the color of the base coat of paint is a SW color called Tanbark. I give the base coat a full day to dry before I start to create the wood grain look on it. Then I start at the top and tape off the center panels for painting. 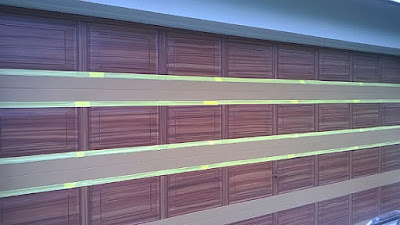 Once the center panels are done I re-position the tape so I can paint the space between the panels. The white arrows in the next photo show where I have re-positioned the tape and the green show where I have not yet done that. I re-position the tape because in the space between the center panels I paint that area with a vertical grain as opposed to a horizontal grain of center panel itself. 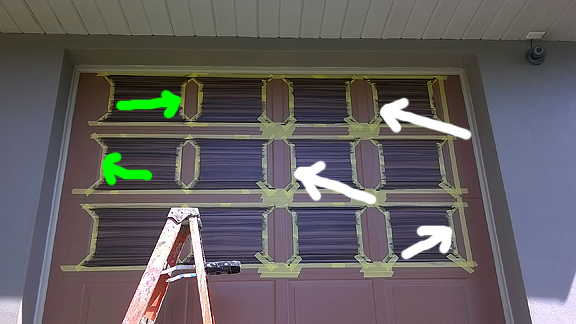 Once a row of panels are painted I paint the space between them with a horizontal grain pattern. In the next photo you can see how I tape off the door for that step. The door is 12 feet high so I had to use my 8 foot ladder to get to the top but even that was a stretch for me. The following picture shows the top 4 rows complete. That took a long day to get that done with all the ladder work involved but you can see how great it is coming out. 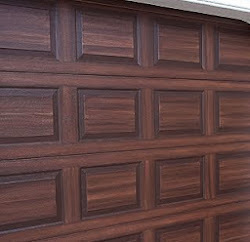 Here is another look at the RV garage door painted to look like wood. 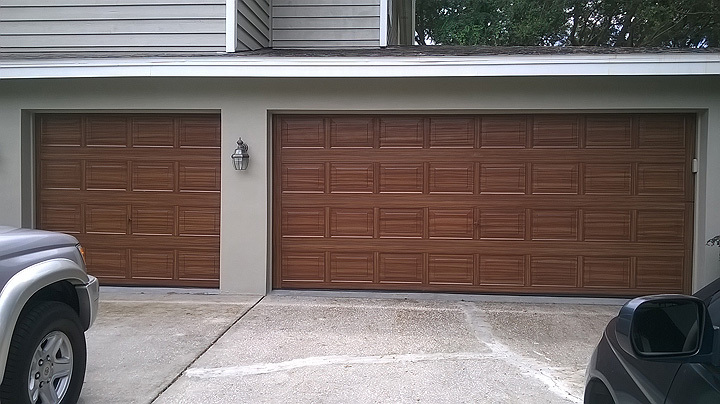 The homeowners are really pleased with the outcome.